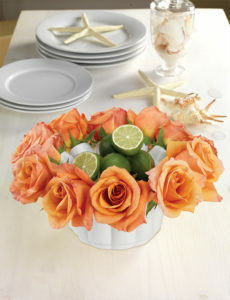 Our orange rose bowl centerpiece is the perfect example of how to decorate with the season’s finest. As evidenced by our love of our Farmer’s Market bouquets, celebrating the uniqueness of the seasons is important to us. In the winter, this means enjoying the abundance of winter citrus at the markets. Nature’s way of warding off the winter doldrums, the peak of citrus season comes in the cooler winter months to perk things up. Chock full of vitamin C, citrus fruits are a great cold antidote and contain antioxidants that can help skin health and promote cancer prevention. And more practically, the color of citrus in the winter is perfect to help brighten things up. This is a boon to florists during a time when lush flowers may not be so plentiful, as citrus fruits can play an unexpected part in bouquets and centerpieces. Purchase a bag of citrus, pile high in a translucent vessel or cachepot and surround with flowers for an edible arrangement. Or, fill a Rose Bowl with the citrus of your choice (we like limes) and add your favorite rose stems to create a centerpiece honoring the season’s best offerings. This has been popular with apples but working with citrus will give you an entirely different color scheme and plays on the season, and is a fun option for an easy tablescape for a dinner party or event. For weddings, as we mentioned in our last post, garlands are becoming quite popular. Set your garlands apart by adding small citrus fruits. In the fall, we saw small pomegranates or artichokes on the table but using small citrus like lemons, kumquats, or mandarins as an accent to a garland would be beautiful as well as seasonally appropriate. Use citrus with eucalyptus for a rustic farm wedding or lush, green boxwood for an indoor reception of any kind. 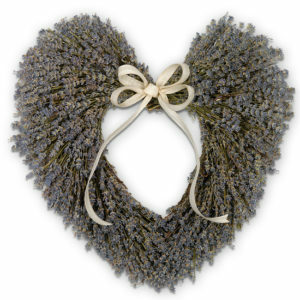 Make clove-scented citrus balls to place on a mantle with this Fragrant Lavender Heart Wreath for a beautifully decorated and scented home. When you use citrus as part of your floral décor, you aren’t only creating a floral arrangement that is appealing to look at but also something that smells equally beautiful. During the holidays, oranges or mandarins are often decorated with cloves, called pomander balls, for a beautifully scented decoration. What’s more, this may help dry noses with a pretty scent and citrus oils from the skins. Place any pomander balls on a mantle with a hung Fragrant Lavender Wreath for a calming, citrusy scent to fill your house. Another great perk of using citrus is guests can take some home as a little souvenir of a memorable event. Small citrus that is used as table accents can be plucked off to take home or you can create small party favors for friends to take with them. For example, if you are using limes in a centerpiece, place small tangerines as a place setting or add as part of a gift bag for a little treat for them to have on the way home from a fun evening. 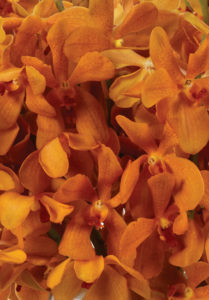 Warm up your winter with citrus hues like these orange mokara orchids. Partaking in winter citrus for their health benefits shouldn’t only be the only thing we think of. The actual colors of the fruit themselves can also provide inspiration on a cold, gray day. From ruby red grapefruits to jewel-like oranges, the warming colors of citrus are so welcoming that creating winter floral arrangements inspired by these colors is a no-brainer. 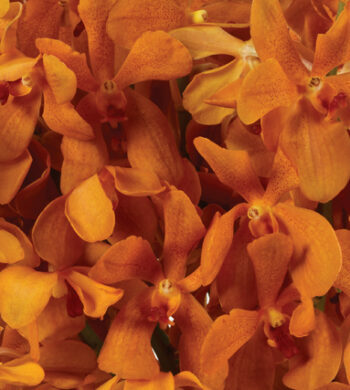 Some flowers that work beautifully in this color scheme are lilies or orange Mokara orchids. Or, choose an all-white palette to create a bouquet or arrangement with citrus accents. The white is reminiscent of many flowers that blossom on citrus trees such as orange blossoms while the monochromatic color scheme feels modern and clean. This season is a time to create as things slow down and many of us come indoors so browse our selection of flowers to find exactly what you want to pair with our favorite winter fruit. This way, you can have a beautiful winter flower arrangement and eat it, too!